I really don't remember what Town and Country was like- the site of the current Santana Row. What I remember was that Valley Fair, the mall across the street was a formidable giant and still is today. I remember reading in the Mercury News a few years back that it was the top grossing mall in all of California... it should still be looming around that spot today given its lofty shops, wealthy clientèle and the sheer effort required to obtain a parking spot. It seemed like overnight that Santana Row was erected and giving Valley Fair a run for its money. It's design was not a new concept in other metropolitans but very new to San Jose. The developers sought to combine living space with chic restaurants and pricey shops much like the developments that line the streets of Rome, Paris, NY, etc. I hadn't gotten the chance to visit till recently. By the looks of it, I think the developers succeeded in their vision. There are fancy dining joints most requiring 2 hour waits, stores that can also be found gracing Rome's Spanish Steps or NY's 5th Ave. and living spaces for the young and hip with the means to afford it. After a filling dinner, a friend and I were searching for a coffee joint to unwind and continue the night away by catching up. I thought of Santana Row... surely there'd be such a place there. 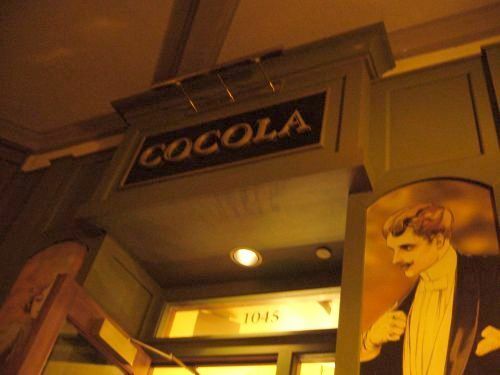 We walked around a bit and came across Cocola. It looked inviting and though I've never been to France I'd imagine this to be just like any cafe there. 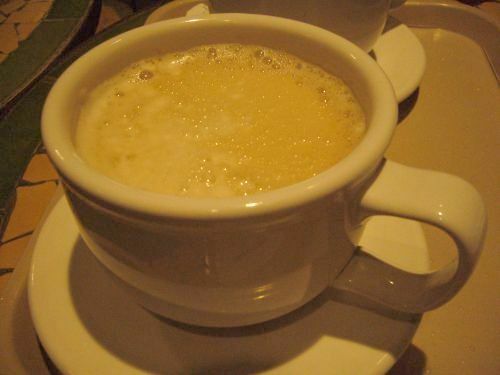 I perused the desserts in the showcase and decided on a mango mousse and hot chocolate. We then found a table amongst the crowd outside. I was somewhat disappointed to find such a classy looking cafe so poorly bussed. We ended up busing what was left on the unoccupied table we chose. We were expecting to be at least called when our order was ready since it wasn't going to be brought to us. Not the case... the order was left at the counter with several other orders for us to pick up as we wished. We did already pay so it would have been nice to take a little care in making sure the order got to us. I suppose the cafe adopted some French haughtiness as well. My hot chocolate was frothy and not too sweet. It was a nice cup of chocolate but I didn't think it was anything to write home about. An overwhelmingly sized cup, I had wished there was a smaller size but the cashier informed me there was only one size for drinks consumed on the premise of the cafe. I always feel an inclination to get mango-anything. Since I spotted the mango mousse cake I went with that. I was again disappointed now with the plastic cutlery provided for the cake. Plastic cutlery seemed to take away from the presentation of the lovely dessert. 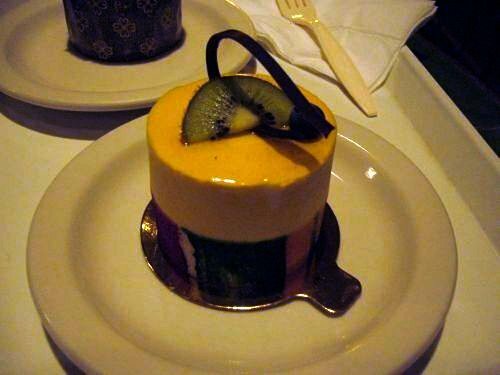 The mousse was creamy, smooth and faintly hinted mango. What I believed to be sponge cake which the mousse sat atop didn't taste fluffy at all... in fact it tasted dry and on verge of being stale. B for mousse F for cake. I've had better drinks, desserts and service but I did enjoy the atmosphere. Have you ever thought of doing a ranking of your top eats? Santana Row is such a weird place. It provides a sort of Disney-esque take on metropolitan life in the little of Silicon Valley suburbia. I still like it, though. Plastic fork and such a lovely looking dessert. They should have at least gave you a plastic metal looking fork! :) Teehee. I actually have. I'm thinking about which places I'll include and will be posting it soon. 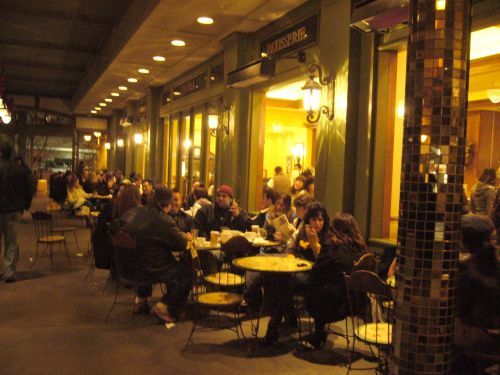 I do like the vibe Santana Row as well... not how small my wallet feels when I walk by the shops. I know!!! I actually feel its not too difficult to have some real utensils in stock. This makes me homesick for the patisseries of Aix-en-Provence where I studied a couple years ago. Is there anything like this in Southern California? Thanks for visiting and commenting. Off the top of my head I'd say Extraordinary Desserts though its become overly trendy and overrun with college kids recently. On my last visit the wait was 1 hour... it was around 11 by then so it'd already be closed by the time I got to sit down. Elizabethan Desserts is awesome but Elizabeth has reduced her open days down to 5 days now and is open only when the nursery she is located in is open. Also I don't think she serves coffee so byoc(bring your own coffee). Bread and Cie is probably the closest match offerings wise. It isn't as fancy looking but the food is better, service is much better and you do get to people watch in the interesting neighborhood of Hillcrest. I've heard of Opera Patisserie but I have yet to try it. Perhaps you'll get to before I do. I also forgot to include Champagne Bakery. Silly me... it's within walking distance. This is probably the closest thing to a French cafe/patisserie that I've visited in SD.